Don't be discouraged by the name. 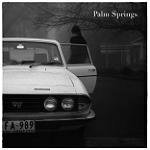 The debut album from Palm Springs is actually a very English affair, free of the punk, emo or jangly West Coast rock that one might associate with such a moniker. The band, essentially songwriting duo DC Cane and Jon Russo, who also run the Random Acts of Vinyl label, are based in Brighton and on the evidence of No Hurt Like A Broken Heart look more than capable of attracting the kind of attention afforded to many of the city's other musical luminaries. A lush, orchestral and ultimately melancholic album, No Hurt Like A Broken Heart is dominated by resolutely slow tempos, mournful cellos, and simple acoustic guitar patterns. As even a cursory glance at the song titles (Echo of Me, The Broken, Tender Remains) would suggest, the chief lyrical theme here is that of loss and regret. Lines like The Cold Light's "And in the cold light of mourning, you are bleeding to grey . . . you are fading from me" take on an added sense of poignancy when coupled with the fact that the record is dedicated to the band's cellist Alice MacGill, who died in December 2004 just a few months into its recording. Encouragingly, especially when you take the fact that this is a debut into consideration, the album finishes as strongly as it begins. Indeed, if forced to select a standout, I'd be torn between the dramatic, sweeping I Am Dust and the rather beautiful There Is A Darkness, arguably the best example of chamber pop to be released this year. Although saying that, the epic finale Tender Remains isn't bad either. No Hurt Like A Broken Heart is an immediate pleasure, a record that demands and rewards your full attention (and that's not me lethargically rolling out another music critic clichÃ© there, listen to this through headphones and you'll see exactly what I mean). It's also one of the finest debuts I've heard this year, and further evidence - although I doubt it was needed - that Brighton is fast becoming the finest source of new music in the UK.